Creative Master Northcord Limited (CMNL) is proud to announce the imminent release of its seventh specially commissioned model. In this instance the model has been commissioned by City Sightseeing and appears in the livery of City Sightseeing Cambridge. 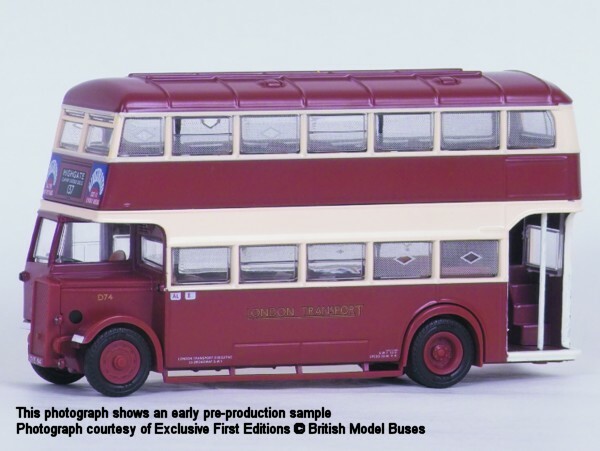 The base for this special model is the Plaxton President Open-top Dennis Trident casting and the model is certain to be a collectible item due to the precise application of the City Sightseeing Cambridge livery. The model is numbered UKBUS0007 in a special series for commissioned models. The eye-catching livery is applied with care to ensure that its multi-faceted icons and motifs are represented like in real life. The smooth sides of the Plaxton President base model assist in the application of the complex livery and ensure that no detail is lost. This replica is a one-piece casting whose construction ensures that there are no ugly metal poles to hold it together. The City Sightseeing Cambridge bus models will be distributed by John Ayrey Die-Casts Limited (UK), Porte Publishing Company (Japan) and Concorde Hobby Shop (HK) respectively. 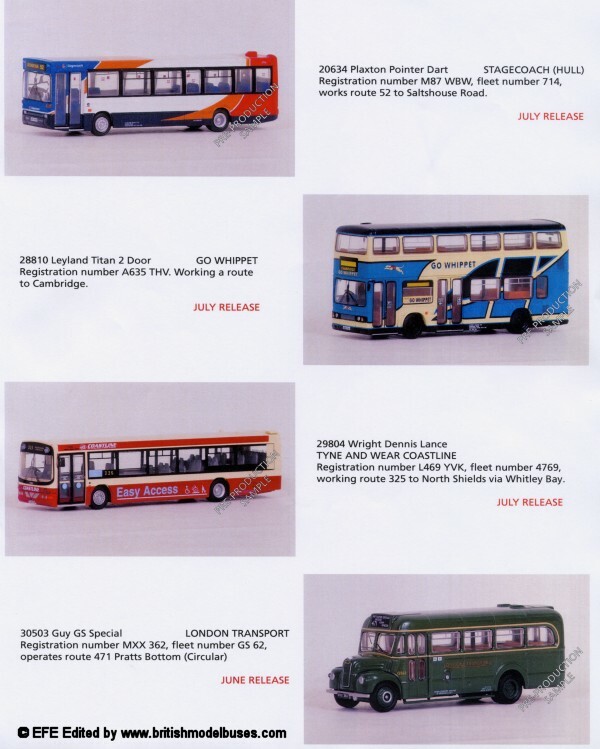 These models will also be available through certain City Sightseeing outlets. ------The World’s Miniature Bus Co. The LT Museum have advised me that the Britbus Red Arrow SMS will be on sale at the Museum on 1 June (along with the OOC Olympic Bid Gemini and the last few EFE GS's). The retail price for the SMS will be £27.99. Both the Olympic Bid and Red Arrow models will also be available at Acton Depot weekend, on 4 and 5 June. Please email first to Lathalmondmodel@aol.com to check on availability. I hope to publish some photographs of the production version of this model during this coming week. 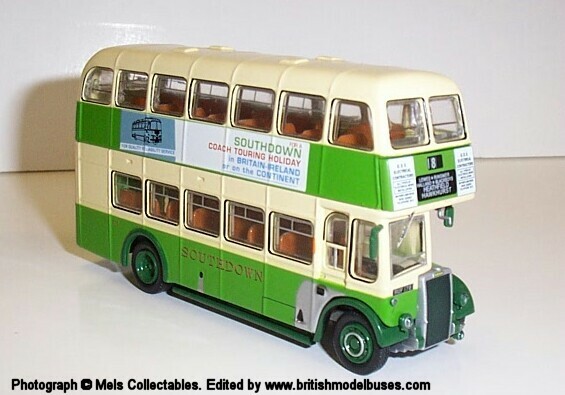 Southdown Motor Services (Unlined livery). 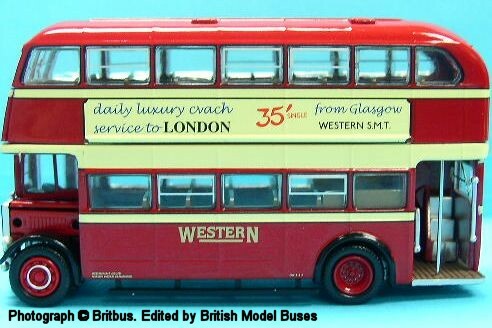 Britbus have further advised that model GL02 Guy Arab 3 Grahams Bus Service is expected to be delivered for Sundays flight to the UK and the production run has been increased to 720 pieces. 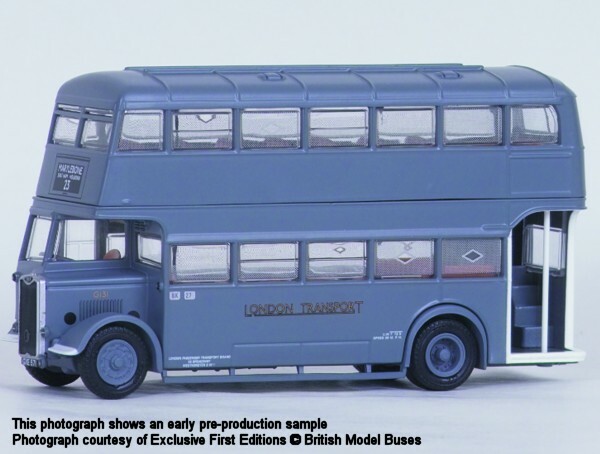 I am grateful to Neil at Time Tunnel Models for advising me that Corgi are releasing a limited quantity of model OM44107 Optare Solo Preston Park & Ride (previously commissioned by Model Collector Magazine) to some selected dealers. He will be taking stock of some of them. If you would like to order one please contact Neil at Time Tunnel to check on availability. L003 Leyland Titan PD2 Beadle - Southdown on route 18 To Hawkhurst. Further details will be given when known. I am grateful to Melvyn from Mels Collectables for sending me the below pre-production sample photograph which he took at his local John Ayrey Wholesaler. The above photograph shows an early pre-production sample. "The great amount of interest created by our Guy GS Special model exceeded even the larger than normal production run that we had anticipated in our ordering. Because of the confusion, stories and rumours surrounding this model, I will inform you of the facts to compare against all the other stories you may have been told. We decided in November last year what quantity to produce and as a guide we used the first release of our 10T10 Regal, which was a very similar model and it had also been under produced for the demand. We looked at the original orders placed for the 10T10 before any cuts were made and added 1100 pieces to create a production quantity, which should have satisfied the market. What we did not anticipate was the mass of over ordering that took place on this model. Your local stockist has the choice to purchase his stock either directly from us or from a wholesaler stocking our models, and to hedge their bets some buy from both sources. Many of the retail shops that buy from a wholesaler are unknown to us and we have no knowledge if they were supplied with this model or what they do with them. We do think that the quantity produced was not that far wrong and it annoys us to see the high prices that are being asked for the Guy GS and I would urge enthusiasts not to pay extortionate prices for it. The model was sold from us as a standard priced model but once it has left our premises we have no control over the distribution or eventual selling prices. All is not lost as we have moved forward the second release of the Guy GS and it will be ready for release in June". ".........Diane, daughter number 3, is about to get married this Saturday. You will be aware of Diane's graphic work as it appears on many of our models and as part of the wedding day we have arranged for the 10T10 from Cobham Museum to transport the Guests back and forth through Epping Forest between church and reception. 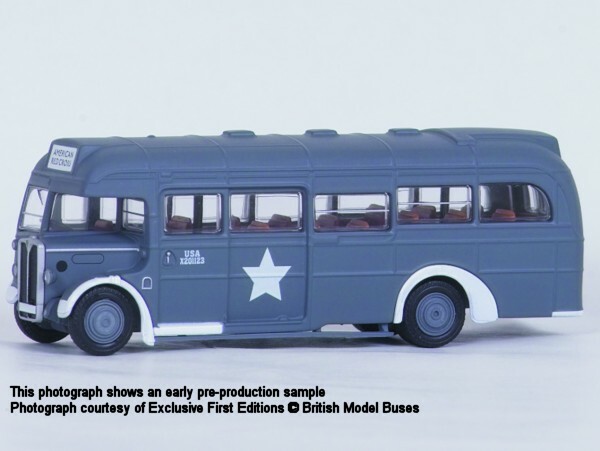 As a momento for the guests we have made 144 models of this bus and we are happy to make two of these very rare models available to our Subscribers in a free competition draw. The first 2 correct replies out of the hat on 2nd of June will win this prize. 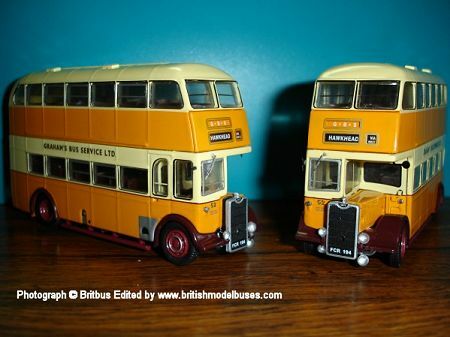 The question...." What was the route used on the first release of our 10T10 Regal model 29901"
"We have been commissioned to produce two new models of Australian buses which this time feature our Leyland TS8 model. These buses were operated by Melbourne Transport with fleet number 117 on route to Port Melbourne and 119 on route to Collingwood. Both models are illustrated on the rear of our Issue 5 Release Sheet, which is enclosed with a separate Order Form in this mailing. We have arranged for just a small quantity of each model to be made available to our Subscribers so if you are interested a quick response is recommended". "We have been asked to produce a model for the Acton Open weekend 4/5th June. The model 29903 features our 10T10 Regal T682c on route Y to Brentwood. The model will be available at the event or from the L. T. Museum shop at Covent Garden". 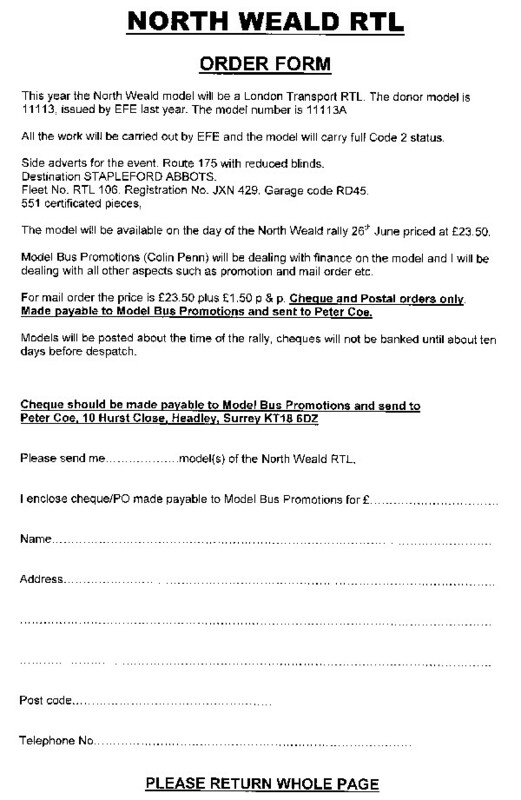 I have to report that this years North Weald Bus Rally on 26 June 2005 has been cancelled by the organisers. The below is an extract of an email sent by the organisers on Saturday 7th May which explains this situation. 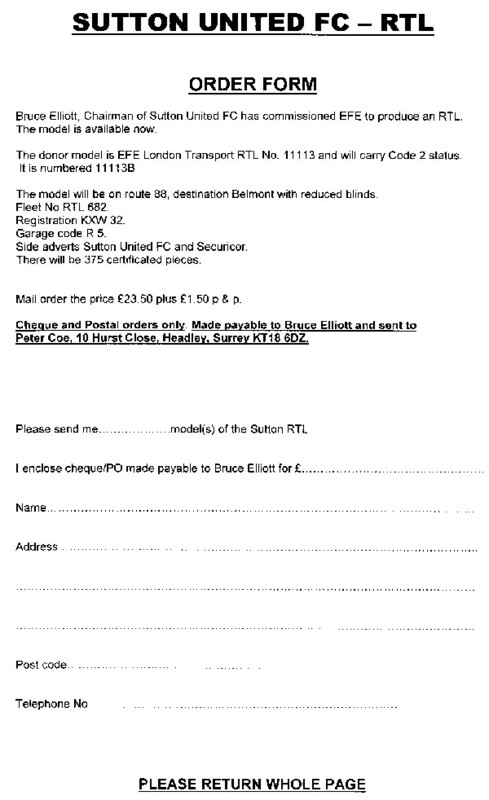 "It is with great regret that the rally organisers have decided to cancel the North Weald Bus Rally. This is to do with a change of management at the airfield and local government red tape, health and safety etc. We have tried to comply but they keep wanting more and more and still havn't formally agreed the booking. We therefore decided yesterday that it was better to cancel it now and give everyone warning rather than go to the wire and have it cancelled by the council on June 25th. Please accept our apologies and we thank you for your support over the years". On receipt of the report I immediately contacted Mr Peter Coe who is distributing this years show model (see news report dated Saturday 7 May below) and told him what I had heard. 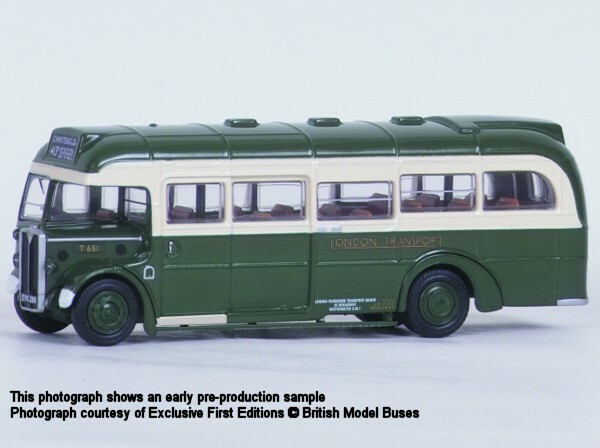 Mr Coe advised me that the model for this years show had already been produced by EFE and that he had taken delivery of them (11113A AEC RTL - London Transport). I received a call from Mr Coe last evening to advise me he had spoken to Mr Frank Joyce at EFE. EFE have advised that even though the rally is not going ahead they will still recognise the model as having full EFE code 2 status. Furthermore Mr Joyce indicated he will write an article for the next EFE subscribers newsletter (which is due for publication late this week or next week) explaining the situation. As previously mentioned Mr Coe has taken delivery of the stock and these models are now for sale. If you would like to purchase one please CLICK HERE for a copy of the order form. 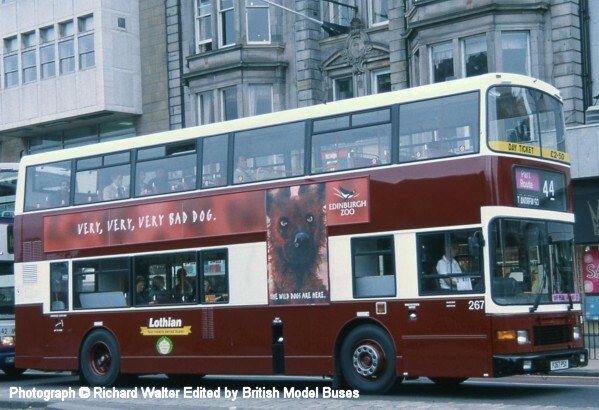 "The next Britbus model to be released this week will be the GL-02 the second of the long nosed Guy Arab III's in the guise of GRAHAM'S BUS SERVICE (an ex Southampton bus). Fleet number 52 on route to HAWKHEAD via Paisley and the registration number is FCR 194. The issue is limited to a production run of 600 models only". Thanks to an enormous amount of hard work by John Bennett (who compiled the listings for me), I have now updated the Toy Fair Diary pages from now until the end this year. I am hoping to publish photographs of both models during this coming week. Further to my news article of last evening, I have now received additional details. The first 60 models produced with certificates numbered 1-60 were produced for Mr Colin Finch of GB Models, Manchester by CMNL (Route 278 passes outside the front of his shop). They have full code 1 status. They form part of the overall run of 1600 models and have the same CMNL stock code (Certificates numbered 61-1600 are the standard release model). They are identical in everyway to the standard release model apart from the route number and destination. I have spoken to Mr Finch this morning who advises me that he still has a very small quantity of these models available for sale at £24.95 + £1.95(P&P UK) on a first come first served basis. No email, please telephone first to check on availability. If contacting Mr Finch please mention British Model Buses. "the release of Bluebird of Middleton Dennis Dart has a variation. But only the first 60 releases show this. The standard release which is Certificate no 61 to 1600 show route 112 but release 1-60 are on route 278 to Trafford General Hospital". Creative Master Northcord have confirmed this is the case and state that the variation model was produced for the operator. Can anybody forward me a photograph of the front of the variation model showing the different route details?